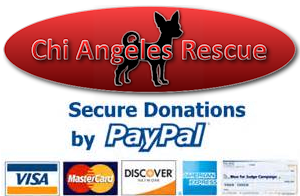 Donate To Chi Angeles Rescue . .
All donations are tax deductible and go to helping rescue, foster, re-home and transport Chihuahua's from the Los Angeles area hi-kill shelters and homing them all over the United States and Canada. Every donation is a blessing and will not go unnoticed in the hearts of the little ones that will benefit for your generous heart to help in our cause.